As you may have noticed, I love Greek and Mediterranean food. There are a couple of recipes inspired by Greek cuisine on my blog: Melitzanosalata (Greek Eggplant Salad), Lamb Souvlaki (Greek Lamb Skewers) or even these spooky Healthy Halloween Cookies. The truth is, I wouldn't be able to try some of the best Greek recipes if it wasn't for my fiancé who comes from Greece. 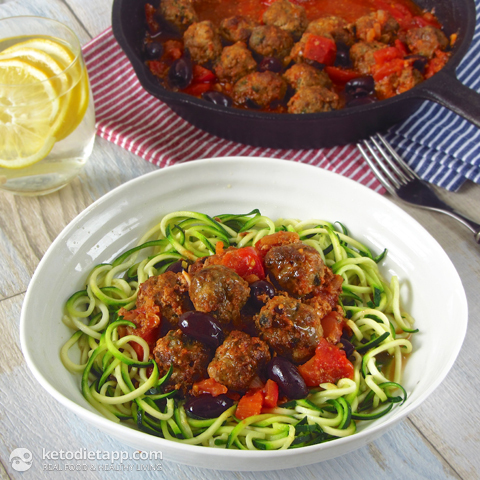 This recipe is inspired by soutzoukakia - meatballs cooked in rich tomato sauce. Note: Chia seeds are used for thickening the sauce. You don't have to use them or you can use 1/2 tsp xanthan gum instead. Keep in mind that xanthan gum is not considered paleo-friendly. You can use any other oil suitable from high-heat cooking. When looking for ingredients, try to get them in their most natural form (organic, without unnecessary additives). Preheat the oven to 200 °C/ 400 °F. Wash and chop the herbs and mash the garlic. 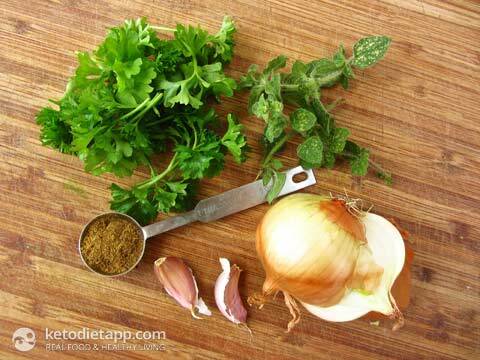 Finely chop the onion and place half of it in a separate bowl. 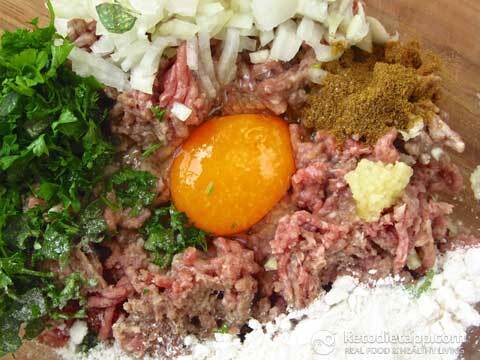 Place the meat, egg, cumin, mashed garlic, chopped herbs, half of the onion, salt and coconut flour into a bowl and process well using your hands. 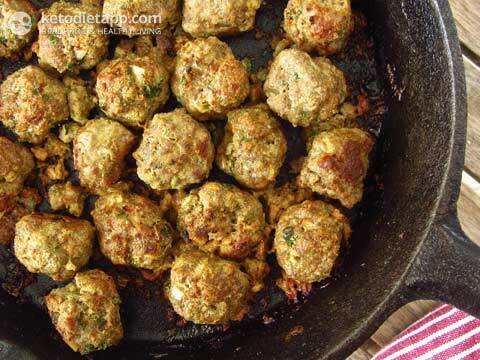 Create small meatballs and place them in a cast iron skillet or on a baking sheet greased with half of the ghee or coconut oil. Place in the oven and cook for 20-25 minutes. Meanwhile, prepare the tomato sauce. 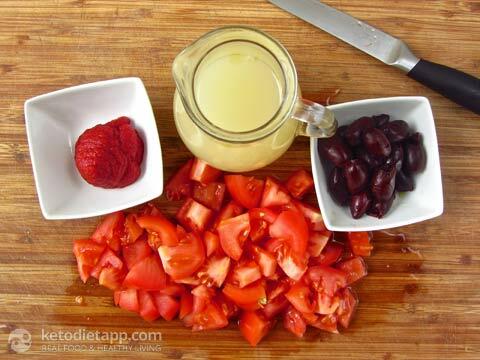 Roughly chop the tomatoes and drain the olives. 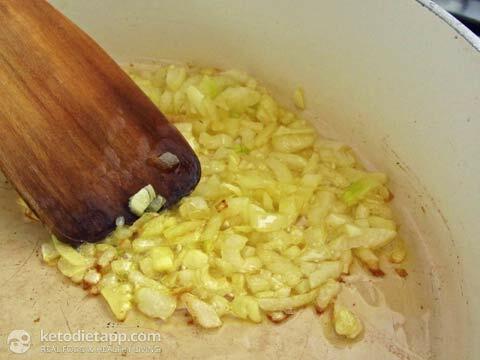 Grease a pan with the rest of the ghee or coconut oil, add the remaining onion and cook until slightly browned. 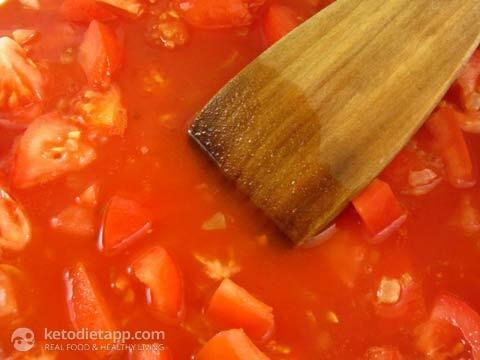 Add the chopped tomatoes, tomato purée, vegetable stock (or bone broth) and season with salt. Cook for about 5 minutes. 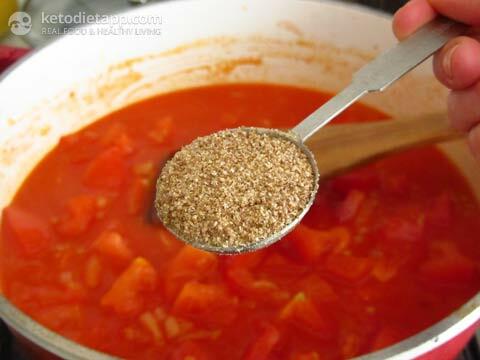 Add the ground chia seeds for thickening the sauce and mix in well. Add the kalamata olives and stir in well. Take off the heat. 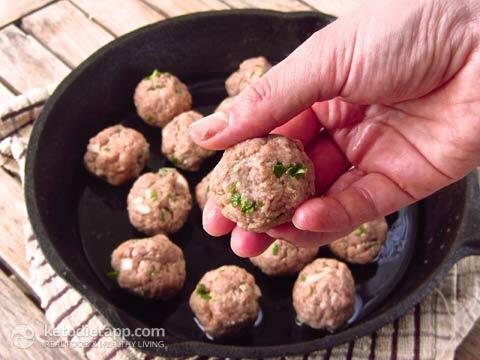 When the meatballs are done, remove from the oven. When done, serve with zucchini noodles aka "zoodles" briefly fooked for 2-5 minutes (I use this spiralizer to make them). 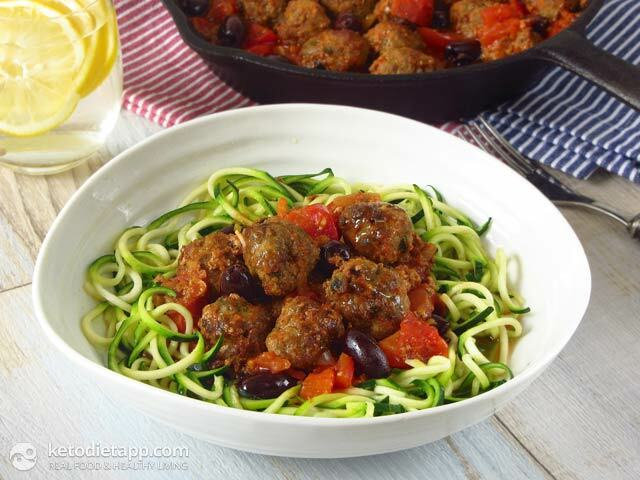 I also recommend you check Mellissa's website The Clothes Make The Girl - she has revealed the secret to make "zoodles" al dente and not loaded with water - ingenious! 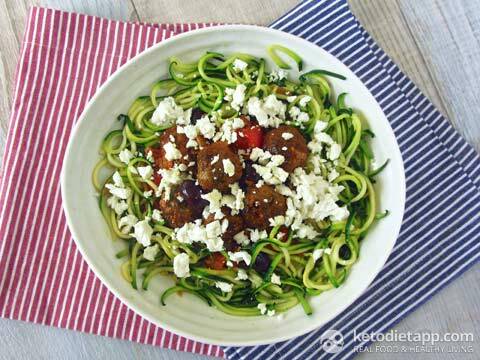 You can try this meal with crumbled feta on top - avoid this step if you follow my Clean Eating Challenge which is dairy-free. Enjoy! Hi Martina !! Bravo !!!! Excellent recipe. I am Greek I made that recipe was delicious!!!! I have your apps at my iPhone and iPad. I am new to all that but your hard work helped me a lot. 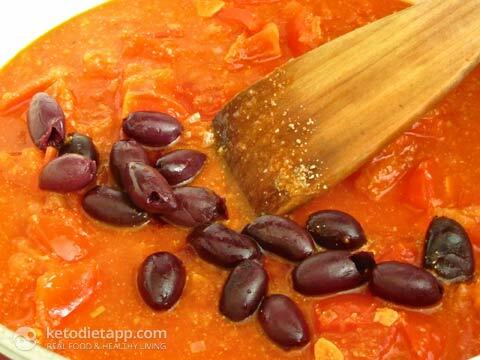 How much is one serving size with this recipe? This recipe makes 4 servings so 1/4 of the recipe. 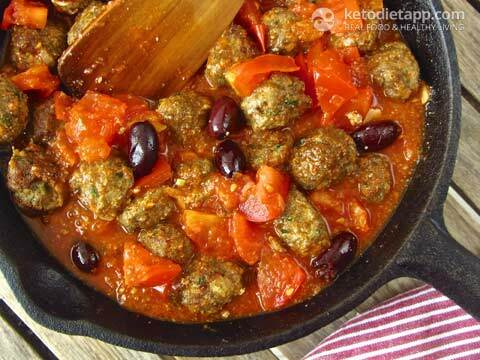 It depends on how big you make the meatballs but can be 5-6 meatballs per serving.